Mona B. Bucket List Mini Canvas Crossbody | P.C. Fallon Co. The Bucket List Mini Crossbody Bag by Mona B. is a compact drawstring bucket-shaped bag with much flair. First of all, its size makes it so adorable. 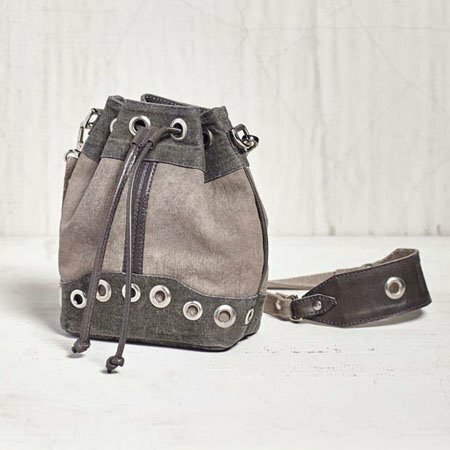 The Bucket List features a two-toned grey canvas construction, with leather drawstring pull, and chic silver grommets at the top and along the base. The functional drawstring pulls it close, and there is also a magnetic tab closure. Inside, the bag is lined with the signature Mona B. cotton lining, and there is one open pocket. The detachable crossbody strap has a 25" drop, and is constructed of heavy canvas and leather. Dimensions are 7"w x 8.5"h x 4"d. Made from up-cycled canvas. The fabric shows the history of its travels which may include stitch marks, minor staining and unique scars and bruises. Color variations and patches add to the uniqueness of each bag. Heavy cotton canvas.